What’s the deal, anyway? Why should I, as a goat, care about where I live? So long as there is grain, hay, pasture, etc (so, FOOD) I shouldn’t really be concerned about my address. I was born in Verona, New York at the Warm n Wooly Farm. I moved to Lowville, New York when I was about six months old. The majority of my life, though, has been spent here, on the mountain top. As a goat, I really don’t have a say in where I live, because, well, I’m livestock and I go where they take me. My philosophy has always been to “bloom where I am planted” and so I started this blog to keep the northerners informed of my activities, and to entertain whoever is listening. IN ANY EVENT, I have found Sparta to be a welcoming place. In Sparta, we have a much longer growing season than in my birthplace. Like 4 or 5 months longer, which makes for more grass and browse, which is important to a goat. Not so important to a goat, but very important to my caregivers, are the other reasons for liking Sparta. There is a rich cultural heritage here; steeped in the textile arts. 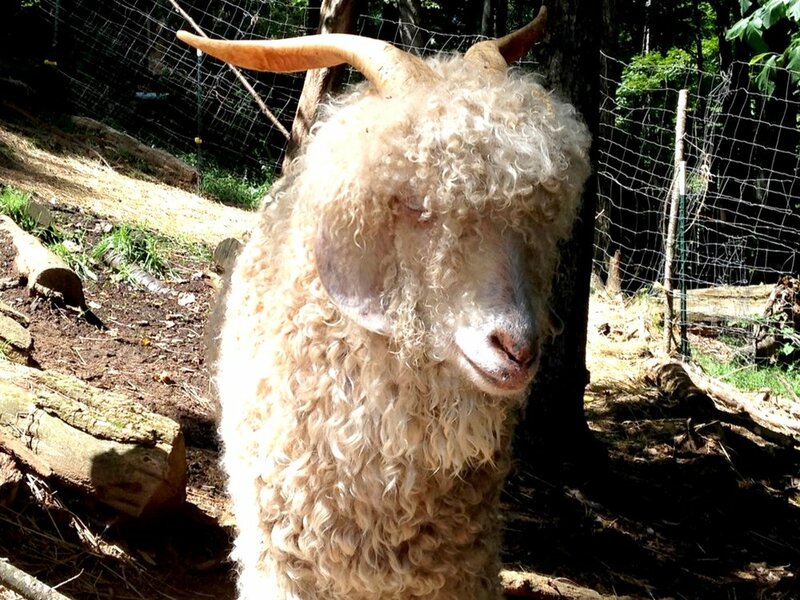 We all know that mohair is a very important component to textiles, because goats make everything from fine lace weight yarn for beautiful garments, to rope and rugs and mens suits. I don’t understand why wool gets all the attention…. mohair is so much more important! Arts education is a big deal around here. The JAM kids have their own house! (Junior Alleghany Musicians). There are music lessons available there. The Writers group holds workshops to teach folks how to be better writers. I sent my scribe (wench, she hates when I call her that) to the lessons yesterday, so maybe she’ll be a little more attentive to this blog. There are book clubs and painting classes and live music many nights per week. The point of this blog entry is that this is a pretty cool place to live. On behalf of myself and the flerd I represent, I’m glad to be a goat on the mountain top. I promise a newsy, picture-heavy posting showing all the progress being made on the farm as soon as I can get that wench to do something around here. (sheesh!) We are all being shorn now so she can go sell the shirt off my back. It feels good. Thanks - for reading frankly speaking!